When you post updates on your business’s Facebook Page, your followers will potentially see those updates in their News Feeds. Each user’s News Feed is like the front page of a personalised newspaper. It includes recent popular updates both from their personal Facebook friends and from the businesses they follow. You may think that when you gain a new fan for your business Facebook Page that they will automatically see your posts in their timeline. In fact, they are highly unlikely to see any of your posts. Just because someone has “liked” your page doesn’t mean they’re necessarily going to see your updates when they log onto Facebook. 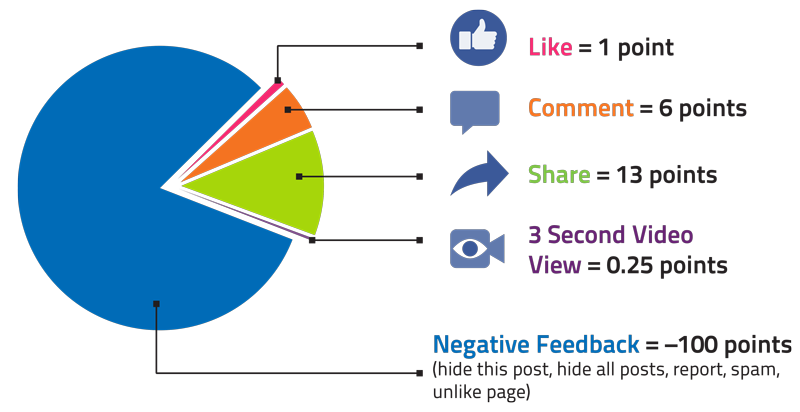 In fact, Facebook says that, on average, only a very small percentage of your fans will see any given update. Facebook has become incredible complex, employing sophisticated algorithms to determine what is quality content. Updates that users have “liked,” shared with their friends, or commented on, will be displayed more often. In other words, the more popular the content is, the more likely your fans will see it. That’s why your job is not only to post content regularly, but figure out what kinds of updates will get your fans to do something. The more you can inspire your fans to click “Like” on your updates, to leave comments, or to click “Share” to spread your words to their friends, the better your “reach” numbers will be. To show up in as many users’ newsfeeds as possible your content must be fresh, engaging, current and compelling. Then it becomes a cycle; the benefit of having a ‘popular’ post is that your subsequent posts will have an increased likelihood of being shown. Not all interaction by users is considered equal. Facebook ranks each of the engagement measures with a different weighting. On the other side, if you post low engaging content or worse content that attracts negative feedback such as the user hides the posts, hides all posts or unlikes your Page, this will have a negative impact on your future posts with a lower reach. You need to be regularly checking your engagement in Facebook’s analytics to see what is and what isn’t working. Of course, for any important messages – you need to pay. If you need more assistance with your Facebook strategy and understanding how to get the most out of it, you can join a group training session or have a private training scheduled with an expert in Facebook.